China won the first gold medal of 2014 Asian Games. 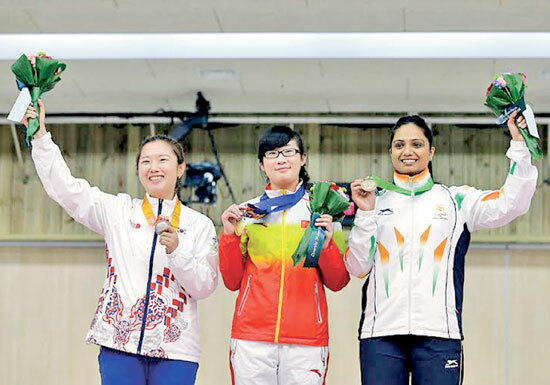 Winner China’s Mengyuan Zhang, centre, silver medalist South Korea’s Jung Jee-hae, left, and bronze medalist India’s Shweta Chaudhry pose for the media during the medal ceremony for the 10m Air Pistol Women at the Ongnyeon International Shooting Range. INCHEON, Sep. 20 – Asian sports heavyweights China bagged three gold medals in shooting while Sri Lanka suffered a humiliating defeat in their men’s hockey tournament opening game against Pakistan on the opening day of the 17th Asian Games competition proper today. INCHEON, Sep. 20 - Unseeded China and Thailand won their respective qualifying round matches of the Asian Games women’s T20 cricket tournament which began at the Yeonhui cricket grounds here today. RUGBY FOOTBALL: The Sri Lanka junior ruggerites will be aiming at the World Junior Rugby Cup 2015 in Portugal by winning the Singer sponsored Asian Rugby Football Union tournament which is scheduled to be kicked-off today (Sunday) at the Racecourse grounds.